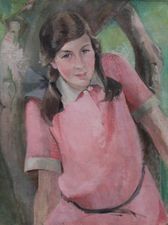 Helen Wingate (fl 1911-1938) was a painter in oil and watercolour of portraits and landscapes. She was the daughter of Sir Charles Lawton Wingate. She lived in Edinburgh and exhibited at The Royal Scottish Academy 25, RSW 11, Glasgow Institute 10 and Liverpool 4.